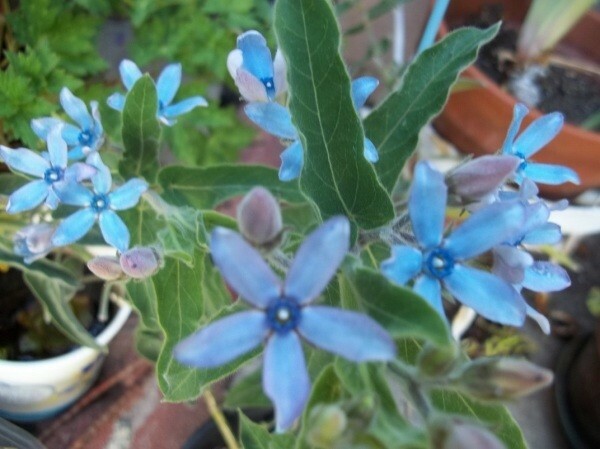 This native of Uruguay and Brazil is a small shrub or vining plant with clusters of sky blue flowers. It is a member of the milkweed family. This is a guide about, "What is this plant?" (Tweedia caerulea). I have a plant with blue star shaped flowers in our yard. Can anyone tell me the name of this plant? It is supposed to be a food source for butterflies? And how about info on the seed pods? What do they need in the way of sun/shade/food/water? Thanks, Catherine was right. I found out enough about this annual plant online that I will start saving seeds for next year for the Path Garden. If it were not for the blue colour I would say that is a star magnolia because of the shape of the flower, the fuzzy pod, and the leaves. New variety? Pretty sure it is Tweedia Caerulea.